Monday, August 7, 1911: I wound up my driving this afternoon, and I’m not sorry either. Carrie was over this evening. We did some planning for that picnic, which we wish to have some time next week if we can. Grandma began driving horses five days ago. As discussed in the August 2 entry, she probably was operating a horse-drawn roller that leveled the plowed ground in preparation for planting winter wheat. As Grandma planned for the picnic, she may have thought about foods that she could take. Beets are in season, so a hundred years ago Grandma may have thought about taking Pickled Beets and Eggs to the upcoming picnic. 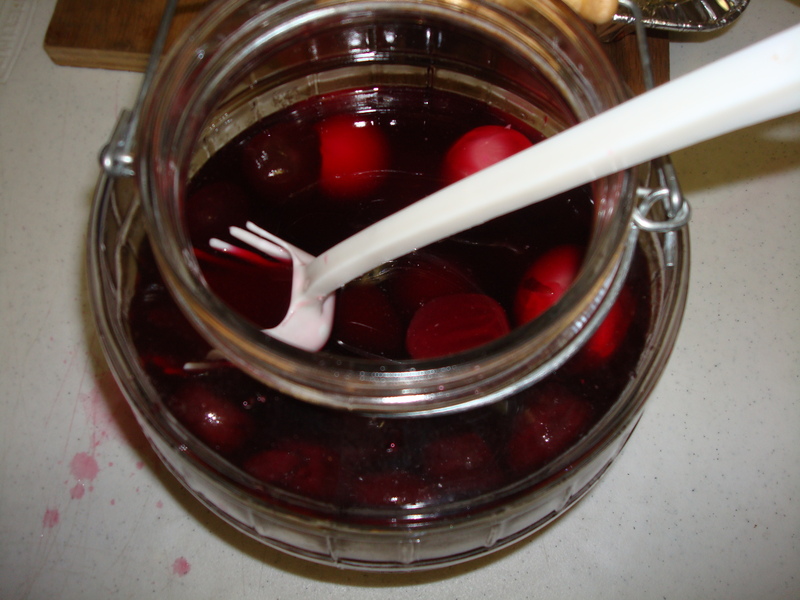 Here’s an old recipe that I use to make pickled beets and eggs. Combine vinegar, beet water, sugar, and piece of stick cinnamon in a large saucepan. Bring to a boil. Stir until sugar is dissolved then remove from heat. Put sliced beets and hard-boiled eggs in a glass jar or other container. Pour cooked liquid over the beets and eggs. Chill overnight to marinate. (For darker eggs, chill for several days before serving.). *Peel beets before cooking (or canned beets may be used–though that’s probably less authentic). Posted on August 7, 2011 August 30, 2015 by SherylPosted in Food, recipesTagged beets, eggs. I love beet pickled eggs, we have seen many recipes over the years, however we just always seasoned with salt and pepper in the vinegar water. We never measured the sugar, just put some in and taste for that point that just starts to take the sharp edge off the vinegar. We usually would make enough to fill a gallon pickle jar in the fridge. The would boil eggs adding along as we took from the jar until the beets did not color as deeply, mom got mad because I loved the beets as much as the eggs. it’s amazing how certain foods bring back memories. We measured the sugar for pickled beets–but the way your family made them sounds very traditional. Many old recipes are based on taste or proportions (1 part sugar, 1 part vinegar, etc. ).